I’m going to be upfront here: this post is about CCDs and readout electronics. Wait, come back, it’s going to be interesting I promise*. It involves the Hubble Space Telescope. Everyone likes that, don’t they? I’m glossing over a lot of the details here, but that’s basically how a CCD works (for more details try this How Stuff Works page on digital cameras, which use the same technology). The CCDs onboard the Hubble Telescope are continually bombarded with cosmic rays which gradually damage them. In particular pockets can form which trap electrons and prevent them from being read out at the correct time. When they’re eventually released, they’re erroneously counted and included wrongly in the image, leaving distinctive trails behind bright objects. This is a major problem for people who need to accurately measure the shape of galaxies in their Hubble images. One such person is Richard Massey who studies weak lensing – the small distortion in the shapes of galaxies caused by their light being bent by a massive foreground object, like a galaxy cluster. Obviously, the presence of little trails behind these galaxies is going to mess things up. Good news though, Richard, and his collaborators have come up with a way to fix this issue. They model the CCD system and manage to figure out where all the trapped electrons have come from and therefore can put them back where they belong at the initial stage of the data processing. This means that degraded images can be corrected back to how they would have been if they’d been taken years earlier, before the cosmic radiation had damaged the CCDs. As you can see in the images below, this will hopefully make things easier for the weak lensing people. Quick post to plug two newish videos from the always interesting Sixty Symbols project in which scientists from Nottingham University discuss some of the symbols we use in physics and astronomy. This time however they’re trying something new – answering questions sent in by their viewers on topics ranging from the irritating astronomer/astrologer mistake to what would happen if you put your hand in the beam of the Large Hadron Collider (the answer to that one’s in the second video)! If we could take a picture of the Milky Way like this knowing where we are in the Galaxy would be easy. Well it’s easy isn’t it, we just go outside the Galaxy, take a picture looking back and see where the Sun sits and what the Galaxy looks like. If only it were that simple. The problem with figuring out our place in the Galaxy is that we are sitting inside it. This means we have to work harder to determine the fine details of the structure of the Galaxy. The faint fuzzy band that snakes its way across the sky has been identified since ancient times. Both its modern colloquial and scientific name derive from Greek mythology. The “Galaxias” was the milk spilled by Zeus’ sister Hera while feeding Heracles (the hero, not the football team from Twente). By the 11th century the Persian astronomer Abu Rayhan Biruni had theorised that the winding smudge was itself made of countless unresolved stars. This theory would have to wait 600 years for Galileo’s first telescopic observations to be proved correct. But what shape did this huge mass of stars take and where did we lie within it? Kant and Wright theorised that the Milky Way was a flat disk of stars which rotated due to gravitational forces. The Herschel siblings tried to map out the galaxy by counting the number of stars in different directions. This lead them to the conclusion that the Sun was fairly near the centre of the Milky Way. But there was a problem with their work, something they hadn’t considered. The space between the stars is pretty empty, but it is not a total void. There are small amounts of gas and dust which, when added up over the huge distances light has to travel to get to us, can block out a fair amount of star light. This gas and dust congregates near the plane of the Milky Way meaning stars within the disk at great distances from the Earth are almost totally obscured. Imagine you are in a big city on a clear day, looking about you’ll be able to see a collection of tall buildings in the city centre. In the other direction the buildings get more sparse towards suburbia. Now picture the same scene in fog. Perhaps you’ll be able to pick out the vague outline of a few skyscrapers, perhaps not. You might only be able to see the buildings around you. This is what interstellar gas and dust does to the study of Galactic structure. A huge breakthrough in determining our location in the Milky Way came in the early 20th century when Harlow Shapley used a class of variable stars known as Cepheid Variables to measure the distance to compact groups of stars known as Globular Clusters. He found that the Globular Clusters formed a cloud centred a long way from the Sun. Instead of being in the centre of the Galaxy we were moved to the quiet suburbs. 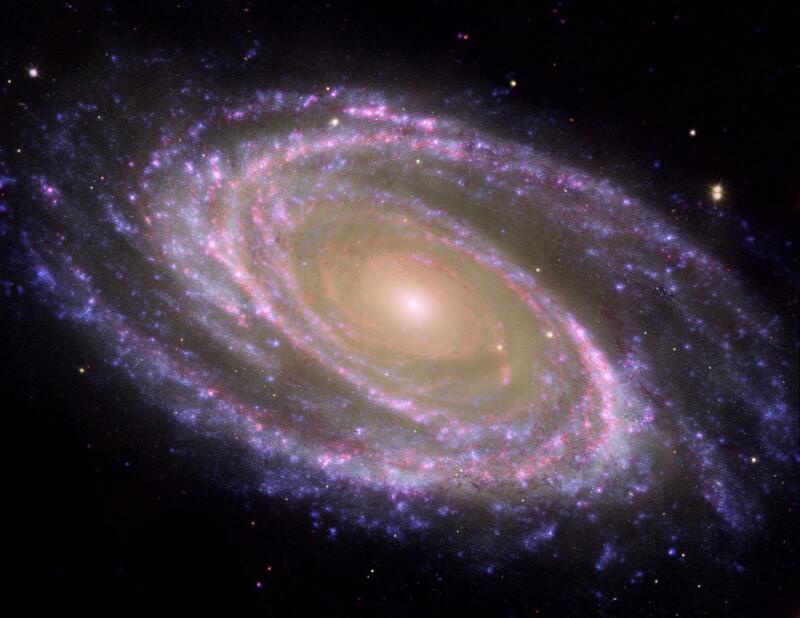 Now with the great expansion of astronomy across the full spectrum of available light (not just visible) we have so much more data with which to study our Galaxy. Radio observations allow us to see how the gas in the Galaxy rotates around the centre, infrared observations show a small galaxy being ripped apart on the other side of the Galactic disk, while we can see stars zipping round the huge black hole in the centre of the Galaxy . These stars allow us to measure the distance to the centre of the Galaxy. One study traced out the orbit of one star and also measured its line of sight velocity relative to the Earth. This allowed them to measure the mass of the black hole at the centre of the Galaxy and also our distance from it. This showed we are 26,000 light years from the centre of the Galaxy, in a fairly nondescript suburb of the Milky Way. Last night Rita, Stuart and I went to the Astronomy Photographer of the Year 2010 awards ceremony at the Royal Observatory Greenwich. We got invited because of the Astronomer’s Galleries that we all curated using some of the entrants to the competition. It was a lovely evening: we got to eat some lovely (tiny) canapes, drink something peculiar which tasted a lot like roses, but also a bit like soap (it was nice, really), see a mini planetarium show featuring all the shortlisted pictures and, most importantly, find out the winners….. 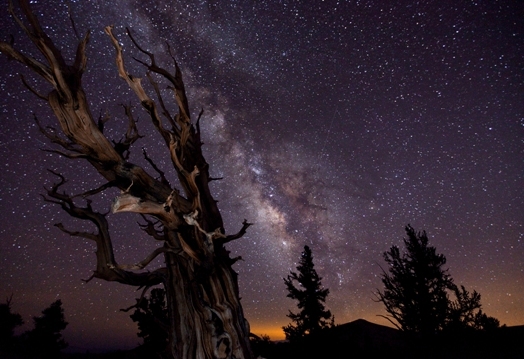 This beautiful shot of the Milky Way paralleled by an ancient tree trunk is called ‘Blazing Bristlecone’ by Tom Lowe from the USA. It’s a well deserved winner and I particularly like the way the tree is picked out by the artificial lighting, though this was apparently an accidental addition! This amazing picture taken by Rogelio Bernal Andreo, shows the region around Orion’s belt (the three stars that make up the belt itself are the bright objects in a diagonal line on the left). We spent ages gazing at this in the exhibition. The level of detail is immense. Look at the middle belt star for instance – it’s not surrounded by any of the dust and gas because its generating a stellar wind which has blown it all away. We all agreed that we’d never seen such a large image of this area, showing all the tumultuous clouds within which new stars are being born. However, to me it looks like there’s a tiny, hunched, figure in the centre hiking his way across this cosmic landscape. 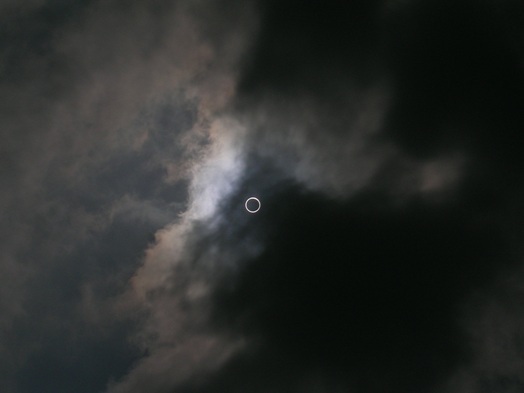 This eclipse photo is ‘Siberian Totality’ by Anthony Ayiomamitis. 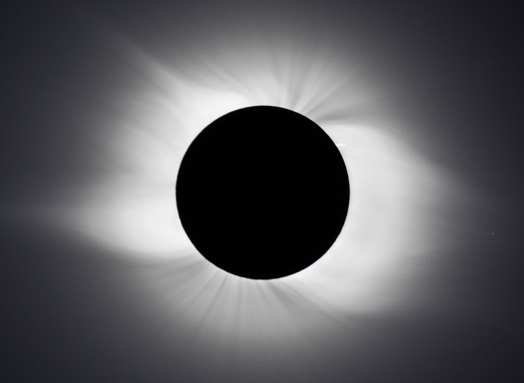 I had to go and have a closer look at this in the exhibition afterwards – there’s so much structure visible in the solar corona. It’s easy, on first seeing this picture of an annular eclipse in India taken by 14 year old Arvind Paranjpye, to mistakenly think that the ring in the centre has been superimposed as it’s such a perfect circle. 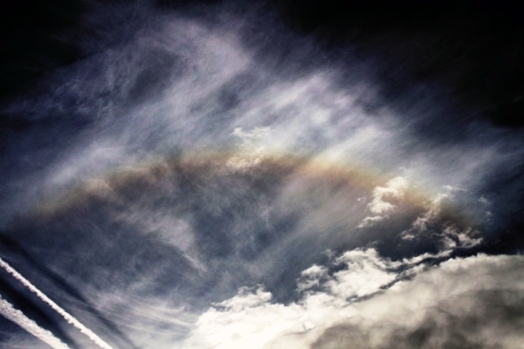 The most impressive bit about this photo isn’t the lovely solar halo but the fact that the photographer, 13 year old Laurent V. Joli-Coeur from Canada, took it from the window of his mother’s car as they were driving down the highway! 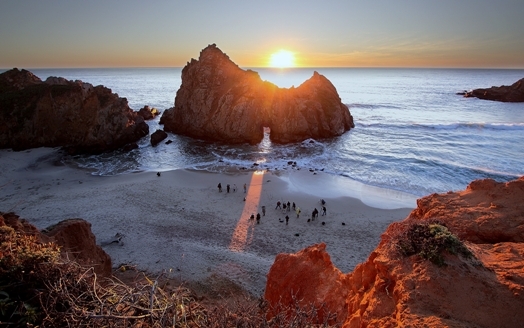 The Sun only directly shines through this arch on the Californian coast for a few days each year and Steven Christenson was there to capture all the other people trying to capture the moment. We looked at this photo for a long time too because of the beautiful shapes made by the waves, rocks and sunlight. We also wondered how the photos taken by the people on the beach had turned out! 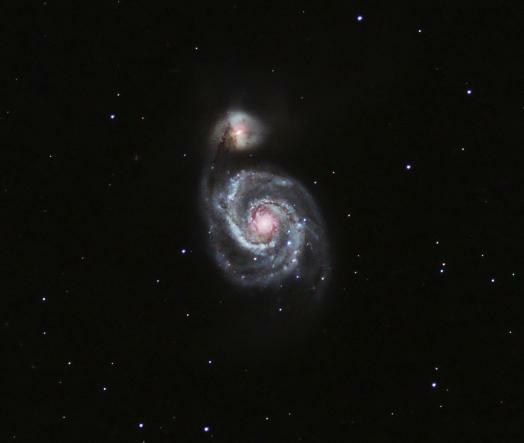 The photo of the Whirlpool Galaxy by Ken Mackintosh shows the quality of the results that can be achieved by a relative beginner. In that respect it’s probably the most inspiring photo in the whole collection. These winning photos, along with the runner-up and highly commended ones in each category are all now on display at the Royal Observatory in Greenwich and will be so until the end of February. The exhibition is well worth a visit – there’s also videos featuring some of the photographers describing their work, as well as an interactive display featuring all the entries received. There’s also an excellent audio slideshow on the BBC news webpage. If I was asked to pick a favorite I think I’d have to go for the overall winner, but the People & Space one would be a close second (and I’d have to give an honorable mention to the deep space Orion wide field shot, which Rita and Stuart both picked as their favorite one). What’s yours? 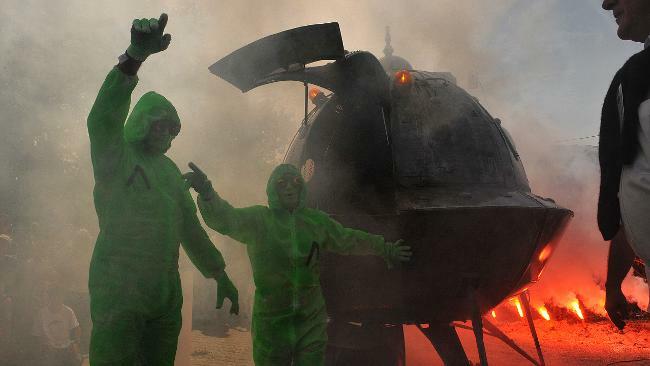 Back in 1976 Arès, a small town in France, decided to install the world’s first (and only) UFO landing strip or ovniport. This seems to have been done as a bit of a joke, especially given that they also exempted any potential visiting aliens from landing fees. They can also take part in local sports if they so wish. However, it’s turned out to be a bit of a tourist draw, though all the visitors have presumably been from this planet! I learnt about this in The Times on Saturday but I can’t link to it because the online version lurks behind the paywall. However, a bit of googling revealed that it was also covered by The Telegraph. It was in the news because last weekend Arès held a party on the landing strip to celebrate the installation of a new flying saucer sculpture, just in case any visiting extraterrestrials are unsure where to aim for. They’ve also put in landing lights. And a windsock. The new flying saucer (soucoupe volante) touches down! I tried to find some out some more about this story but the majority of the information out there is (unsurprisingly) in French. I did manage to find the official programme for the festivities (there were molecular gastronomy demonstrations and a laser show) and also some photos from the day apparently featuring another alien. 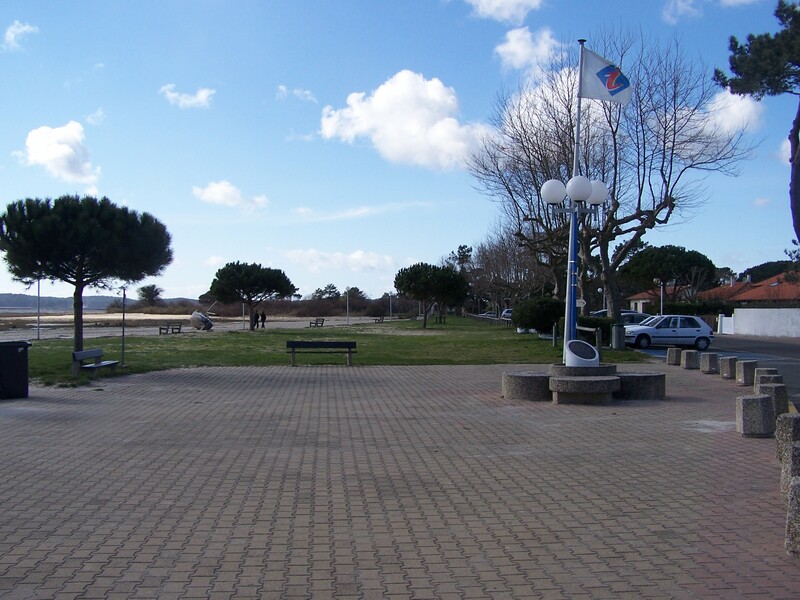 Now all the residents of Arès have to do is sit back and see if their new features attract any more! The HR 8799 system as seen by the Keck Telescope in 2008. The central messy region is where the star has been masked out. Ok, so you’re young, you’re surprisingly dusty, and you don’t match the models. No, not a picture of my geeky childhood, but the extrasolar planet HR 8799b. 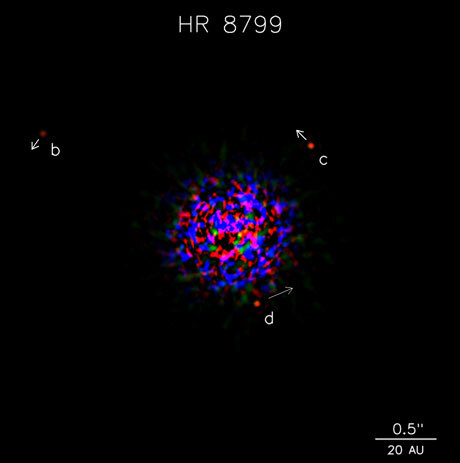 It orbits the star HR 8799 and, along with its two companions, is one of the two extrasolar planetary systems to be directly imaged, as shown above. Unsurprisingly it’s the dot labelled ‘b’. Adaptive optics systems on Keck and other large ground-based telescopes make sharper images than even the Hubble Space Telescope. With adaptive optics, we are learning an incredible amount about objects that are smaller than the lowest-mass stars and larger than the most massive gas-giant planets in our solar system. When they analysed their data they found little or no methane, which, since the amount of this gas can be used as a thermometer, meant that the planet is ~1200 Kelvin; this is ~400 Kelvin warmer than its predicted to be by the current best theoretical models. This, they think, is because it has more dust and clouds in its atmosphere than expected. In related news, in a totally different part of the Galaxy, two more groups of astronomers (in Exeter and Florida) have also been taking spectra of two other extrasolar planets – HD 80606 b and XO-2b, this time using the Gran Telescopio Canarias. In these cases however, their big result is the first detection of potassium in their atmospheres, a result that this time was just what the modellers were expecting. This is an exciting time for exoplanet work. The data are finally catching up with the models and, as usual some things match well, and some things raise more questions than they answer. Clearly, there are fun times ahead! It’s time for our second guest post here at the Gutter. Today Miller Crawford from The Fourth Circle is sharing his tips for easily capturing lovely images of the night sky. Spend a few minutes surfing NASA’s Astronomy Picture of the Day archive and the overwhelming beauty of our universe might just bowl you over. The floral fronds of the Orion Nebula; the delicate wisps of a supernova remnant; the icy blue hue of the gas-strewn Pleiades; the perfect mathematical trace of a spiral galaxy: space is dead pretty, frankly. Sadly, our eyes aren’t sensitive enough to capture all that beauty. This is where astrophotography comes in. Long exposures let the light from faint astronomical objects build up on a sensor or photographic film, allowing a camera to capture details completely invisible to the naked eye. Cutting-edge astrophotography is more than a hobby – it is a serious, demanding science that requires a bucketload of skill, concentration and patience, not to mention a telescope with a solid and accurate motorised mount and a beefed-up computer with complicated image processing software. Looking at some of the photographs in the Astronomy Picture of the Year galleries (like the ones here, here and here) can be simultaneously awe-inspiring and daunting. Sure, you’d love to take such incredible photos yourself, but how on earth do you get started in such a daunting field? Thankfully, astrophotography isn’t just for the gadget-heavy expert; you can take satisfying astrophotos with a more modest camera setup. All you need is some knowledge of the sky, a little patience and realistic expectations. A stunningly detailed image of the Orion Nebula will be beyond you at first, but soon you’ll be able to capture stunning vistas of our galaxy with surprising ease. So here it is, a guide to astrophotography for beginners, by a beginner. First of all, you’ll need a digital single-lens reflex (DSLR) camera. There are many brands out there to choose from, but the most popular are Canon and Nikon. Entry-level models are fine; the more expensive models are more complicated to use, and their weight can cause stability problems. A compact digital camera is less useful; you need the ability to take arbitrarily long exposures, for example. Apparently they are excellent for lunar and planetary photography, but that’s another story. An old film SLR is another option you might choose; the growing scarcity of film is a problem, and there are other technical issues that must be addressed. I’ve tried both film and digital astrophotography, and the latter is much easier. What about lenses? The lens that comes with the camera should do you at first – you’ll be able to take some nice wide-angle shots with the 18-55mm zoom lens that comes with a Canon DSLR, for example. A telephoto lens can be useful to play with as well – I have a 55-250mm zoom lens I use to capture the Moon and various deep sky objects. Last of all, you’ll need a tripod – as tall and stable a model as you can afford. 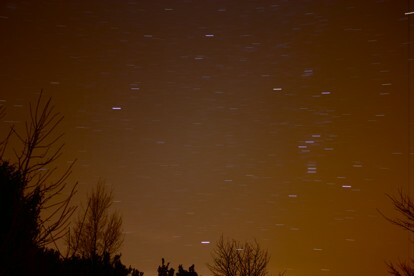 Astronomical objects are faint, and long exposures are needed to capture them properly. Shaky hands and astrophotography don’t mix! A good solid spot to rest your camera will do at a pinch, but you’ll be very limited as to where you can point it. Start by taking a simple photograph of the night sky. Wait for a clear, moonless night; get away from city lights if you can. Put your camera on a tripod and aim it at your favourite constellation (Orion is a great place to start) using a wide-angle lens. Scenery or trees can add interest to composition. Set your camera’s ISO number to 400 or above and the f-number to the lowest your camera will allow. Then set your exposure to “bulb” so you can control exactly how long the camera shutter stays open for. Manual focus on infinity, then take a 30-60 second exposure. Your photo should show the colours of the stars; it will also show stars too faint to see with the naked eye and maybe even a few deep sky objects. 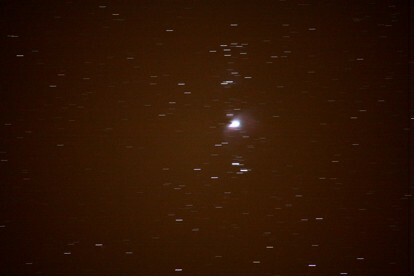 The photo below is a 60-second exposure of Perseus using an ISO of 1600. Many faint stars are visible and the famous “Double Cluster” is lurking behind the tree to the centre-right of the image. Alternatively, your photo might be a fuzzy mess. Don’t worry: focussing can be a tricky business in astrophotography, and that simple statement “manual focus on infinity” gets entire chapters devoted to it in astrophotography books. Using your camera’s autofocus won’t work on the sky, hence the need to use manual focus. Trouble is, stars are faint and difficult to see through the viewfinder, making precise focussing tricky. If you’ve got a DSLR that offers a “Live View” LCD screen function life gets much easier. Aim at a bright star, planet or distant light, view it onscreen using Live View’s highest magnification setting and focus until the image is sharp. If your camera doesn’t have this function, you’ll have to focus as best you can through the viewfinder. Take a short test exposure and zoom in on stars in the resulting photo. Adjust the focus if they look blurry and repeat until you’re satisfied. Camera shake is another problem that can spoil your astrophotos. Touching the shutter button vibrates the camera, meaning light from a star briefly gets spread out across the camera sensor. The longer focal length of lens you use, the more obvious camera shake becomes. You can avoid it by using the timer mode on the camera or a remote control that triggers the shutter from a distance. I use the latter method – the £20 spent on the infrared remote was money well spent! That’s not enough, though. A mirror inside a DSLR diverts the light coming through the lens to the viewfinder. When the shutter is released, this mirror flips up and lets the light land directly on the camera sensor. This flipping action causes internal vibrations, again smearing starlight across the sensor. Many DSLRs have a function called “mirror-lock” to help alleviate this. Switch this function on and the shutter opens a few seconds after the mirror flips up. By then the vibrations have died down, giving you a shake-free photo! Once you’ve taken a few constellation shots and become used to manual focussing, you could try to capture some “star trails”. The Earth’s rotation causes the stars to move across the sky in circles around the celestial poles. In long exposures, stars become streaks of light instead of point sources. Set your camera’s ISO number to a slightly smaller number (200 or 400 perhaps) and set the exposure time to “bulb”. Press the shutter button once, wait 10 minutes or so and then press the shutter button again. The resulting photo will show colourful trails instead of point like stars. Nearby sources of light pollution should be obvious too! Longer exposures will give you longer trails, and if you shoot near the North celestial pole you’ll see the stars forming concentric circular arcs around an unmoving Polaris. Below you’ll see a 5-minute exposure of the Winter Triangle at ISO 100. 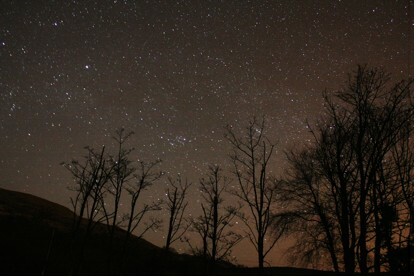 This photo was taken near the centre of Edinburgh, and the light pollution is all too apparent! If you want to photograph the sky without star trails you’ll have to limit your exposure time. The bigger the focal length of your lens, the less time you have before the stars start trailing. With my 18mm lens, a 60 second exposure yields stars that look pretty much like points; at 250mm even a 5 second exposure gives noticeable star trails. Astrophotos often look a little dark and muted; how can you make them look better? Entire books are devoted to the intricacies of image processing, but adjusting the exposure levels, contrast and histograms of your photos using simple software can produce great results. There are lots of programs out there that let you do this; even the basic features offered by the likes of iPhoto really improves contrast and brings out hidden details. Most of the photos in this post have been adjusted slightly in this manner. Capturing the Milky Way is a simple route to excellent astrophotos. Consult a star atlas and pick a constellation the Milky Way passes through. 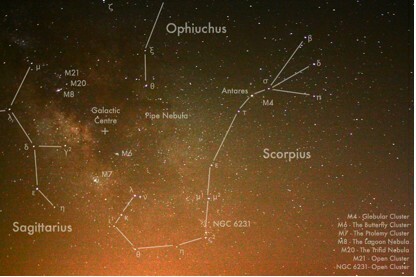 Good summer bets are Cygnus and Aquila for those in British latitudes; if you’re far enough south, Sagittarius and Scorpius house the spectacular central region of the Milky Way. In autumn aim for Perseus and Cassiopeia, and Orion and Gemini make great winter targets. Use the highest ISO setting and the shortest focal length you can and expose for 60 seconds (or even 90, 120 or 180 seconds if you don’t mind small star trails). 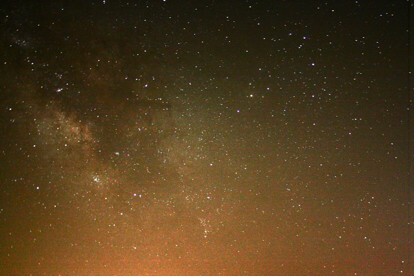 The richness of the Milky Way should be obvious in the resulting photo; you’ll notice brighter patches and dark dust lanes cutting across the band of light. Depending on where you aimed, you might even capture star clusters, globular clusters or nebulae. 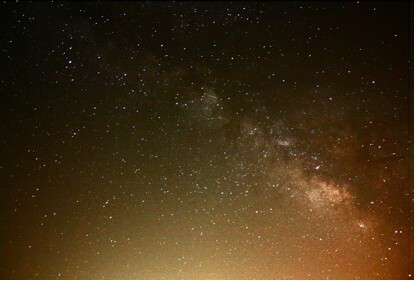 Below are a few Milky Way photos I took on holiday in Greece this year. Despite the hideous light pollution to the south, I still managed to capture the Milky Way, some open clusters, a globular cluster and some famous nebulae. If you have a telephoto lens with a focal length of 200mm or above you might want to try photographing the moon. You can let the camera adjust the exposure automatically if you make sure it takes the reading from a spot centred on the moon rather than an average reading over the whole frame. Alternatively, exposure times for a variety of moon phases, f-numbers and ISO settings are available in Michael Covington’s book Astrophotography for the Amateur or at http://home.hiwaay.net/~krcool/Astro/moon/howtophoto/ . Here’s an example I took earlier this year – a zoomed-in portion of a shot taken with a lens set at 250mm. The exposure time was 1/250th of a second. It’s a little blurry, but craters and seas are plainly visible. 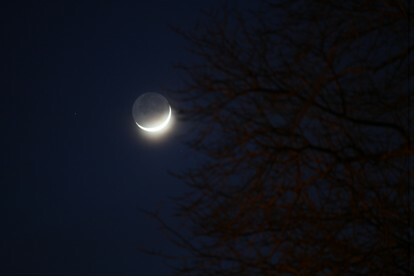 If you’re photographing the crescent moon, a longer exposure (1 – 2 seconds or so, depending on the camera settings) will capture Earthshine, the faint glow on the unlit portion of the Moon caused by light reflected from Earth. 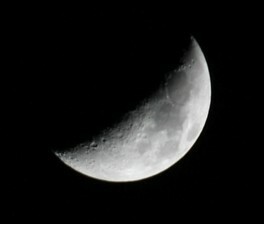 The lit crescent will be horribly overexposed, but seas and craters on the unlit side will be dimly visible, as shown in the 2-second exposure below. You could also aim for objects like the Pleiades, the Orion Nebula or the Andromeda Galaxy. Just experiment with different ISO settings and exposure times! A 20-second exposure of the Orion Nebula at ISO 1600 shows trailed stars but captures the glowing gas very well. So what comes next? Piggyback astrophotography is the next big step; here you put your camera on a motorised mount (often the side of a telescope!) that follows the sky’s motion, allowing you to capture long exposures with pinpoint star images. This really helps you capture faint deep-sky objects; virtually all of the stunning astrophotos out there will have used guiding. The ultimate thing to aim for is prime focus astrophotography, where you attach your camera to a telescope on a motorised mount and image at magnifications a telephoto lens can only dream of. You can immerse yourself in sophisticated image processing techniques such as unsharp masking, deconvolution and other arcanely named things. Then you can start image stacking, where you combine multiple images of the same object to increase detail, dynamic range and contrast. All of this is another story though, and it’s one I can’t tell. I’m still a beginner, but with any luck I’ll keep getting better. If you’re eager for more information, there are loads of useful websites out there devoted to astrophotography, and Michael Covington has written two excellent books on the subject – Astrophotography for the Amateur and the more recent Digital SLR Astrophotography. Hopefully I’ve convinced you that even a rank amateur can take satisfying astrophotos and have a lot of fun doing it. Go on, have a try – the results may surprise you!